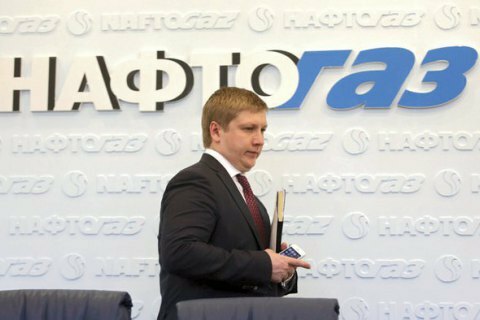 Kobolev says it has to do with Naftogaz's refusal to pay Gazprom for gas consumed by separatists. The energy customs office of the State Fiscal Service has issued two fines of 7bn and 1.3bn hryvnyas to the head of the Ukrainian state-owned fuel and energy company Naftogaz Ukrayiny, Andriy Kobolyev. He published the fine notice dated 28 February on Facebook. "So (as a physical entity) have to pay 8.3bn hryvnyas 'within 15 days'. The reason mentioned in the text of the resolution says 'I did not enable the submission of an additional customs declaration with the full package of shipping documentation," he said. According to Kobolyev, the true reason is that Naftogaz refused to register and pay natural gas which Russia's Gazprom supplied to the self-proclaimed Donetsk and Luhansk people's republics. "That is why we cannot provide a full package of documents. Therefore we will not pay for gas which we neither ordered nor consumed, but on which Gazprom insists," he said. The fine notices are signed by energy customs head Ihor Pykovskyy. At the end of last year, the Stockholm arbitration ruled that Naftogaz Ukrayiny should not pay for gas supplies to separatist-controlled areas in Donbas.